Herbert Hezlep has a bachelor’s degree in business administration from the University of California, Berkeley. In 1950, he joined his father’s small hardware manufacturing company, Acme General Corporation, which eventually was expanded from its base in Monrovia, California, to Canada and Europe. Herb served as executive vice president, president, and chairman of the board before retiring in 1988. Active in his community, he has served as president and board member of the YMCA of Monrovia and board member of Huntington Medical Research Institutes in Pasadena. Herb followed in his father’s footsteps, joining the Rotary Club of Monrovia in 1958. He became club president in 1964-65, district Group Study Exchange chair in 1967-68, and district conference chair in 1973. Herb has been an active supporter of the Group Study Exchange program over the years and considers it his favorite Rotary Foundation program. Herb and Elizabeth have been married for over 57 years. They have four children, four grandchildren, and one great-grandson. Liz is a retired society editor for the local newspaper and remains active with the Luminaires, a support group for the Doheny Eye Institute. Herb and Liz support The Rotary Foundation through the Herb Hezlep Endowed Fund. Detro Sells was inducted into Rotary Club of Monrovia in 1962 and served as President in 1982-1983. He graduated from Williamsport, Indiana high school and moved to Detroit looking for work. There he met Bliss, and they were married in 1941. When WW II came to the USA, Detro joined the Marines. An exceptional marksman, he was ultimately assigned to the defending headquarters unit for Admiral Nimitz of the United States Navy. His unit served in Hawaii and Guam and other locations. Bliss had returned to Indiana while Detro finished his tour of duty. After the war, Detro and Bliss traded their home and furnishings in Williamsport for a 1947 Pontiac and trailer and headed west. They arrived in California in 1949, staying first with relatives in Temple City. Work after the war was very difficult to find but Detro had some skill working on radio cabinets. During a job search he heard about California Furniture in Monrovia. He and Bliss visited the town and found ‘an open city with people out and about.’ Detro met the owner of California Furniture, a Rotarian named Neil Hunter. Neil offered Detro a job paying $55 a week; a few years (and hopefully a few raises) later, Detro became a partner in the firm. 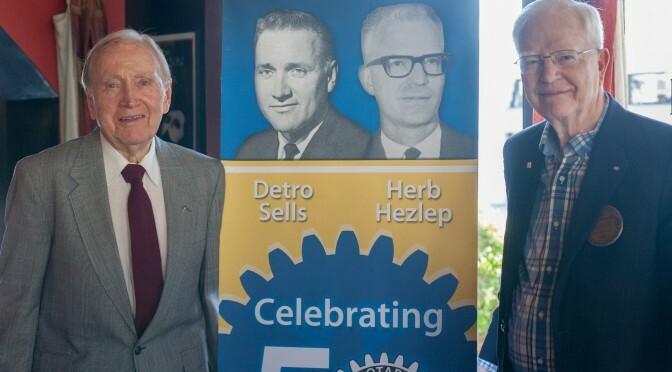 After Hunter’s retirement, Detro and Bliss opened Sells Furniture at 627 S. Myrtle in 1960, and in 1962 Detro joined The Rotary Club of Monrovia sponsored by Neil Hunter. Sells Furniture prospered until Detro’s own retirement at age 75, in 1997. In addition to his term as President of the Rotary Club of Monrovia, Detro was President of the Monrovia Chamber of Commerce in 1976 and also served as Chairman of the Monrovia Merchants Association. Detro and Bliss, married since 1941, have been a team of professional success for years. Detro and Bliss were blessed with four daughters: Georgia Jean; twins Sandra Leigh and Susan Marie; and Lana Gail. They have grandchildren and great grandchildren that can’t be counted on fingers and toes. We would like to give a big Thank You to all our Sponsors at our Old West BBQ & Casino Night! It was a great evening and we couldn’t have done it without your help! Promote Your Business, Have Fun, and Help Your Community All at the Same Time! Howdy Cowboys and Cowgirls!! It’s time for the Second Annual Monrovia Rotary Club Old West BBQ & Casino Night. The event is September 7, 2013 from 6-9 at the Monrovia Community Center. It is a fun filled evening for everyone to come together and raise money. As members of the Rotary Club of Monrovia, we are dedicated to helping our local community through volunteer service, fundraising and providing assistance to those in need. However, we need your help. It is only with the financial support of our community that Rotary is able to consistently accomplish significant projects including, but not limited to: providing thousands of dollars each year in college and vocational scholarships, sponsoring the Santa Clothes program (providing local at need families with school clothes for the upcoming year), and supporting Monrovia Reads, School Tutoring, the Foothill Unity Center, the Boys and Girls Club, the YMCA, and many more. This event is a great way to network and meet a larger portion of the community. Last year 150 people attended and we are working hard to have higher participation this year. There are 3 great ways to promote your business through this event. Event Sponsorship – There are a few great sponsorship options, that also include tickets to the event!! See the attached Sponsorship Flyer or go to http://www.monroviarotaryevents.com/Sponsorship.html for more information. Silent Auction Donation – Promote your business by donating an item/gift certificate from your business or just donate a gift basket. Any donated items will be advertised at the event as donated from you and/or your business. Contact Courtney Oberndorf (703) 953-8321 to pick up items or drop them off at Dr. Domotor’s Animal House in Monrovia anytime. The event is September 7th, 2013 at the Monrovia Community Center. Tickets are $70 each and include dinner, 4 drink tickets, and 250 playing chips. There will be entertainment, food, and a photo booth! What more can you ask for? We hope to see you all for an amazing night of fun, fellowship and fundraising for our community! The organizational meeting for a new Rotary Club in Monrovia was held on June 22, 1922 at the offices of the Southern Counties Gas Company, 114 E. Lemon Avenue in Monrovia. This historic location still exists in Old Town Monrovia. This was after it had been determined that there was a sufficient level of interest in a new club and enough individuals who would qualify as charter members. Application was made to Rotary International for a new club in Monrovia, and the Rotary Club of Pasadena was the sponsor. The application was approved by Rotary International, and the club’s charter was issued October 24, 1922. Monrovia Rotary was Club #1269 in the Rotary World. The first president was Walter E. Keefe, District Manager for the Southern Counties Gas Company. The last surviving charter member, Dr. William G. Barks, died November 24, 1967 after being a member for forty-five years. Over the years, Monrovia Rotary has been honored to provide two district governors for our district: George Carlson and William “Billy” Ryan. The former is now memorialized with an award presented annually to a member of the club who has provided outstanding contributions to the betterment of the club, while the latter is memorialized with a scholarship presented annually to an outstanding scholar-athlete at Monrovia High School. The fist civic project attempted by the Club was the erection of a band shell in Library Park in Monrovia. The band shell was constructed during the 1927-1928 Rotary Year. While it has been moved from its original location, the band shell still serves its intended purpose in the park. New signage to be installed in October of 2012 will now prominently identify the band shell’s Rotary origins. Also during the 1927-1928 Rotary Year, the Monrovia club sponsored the formation of the Rotary Club of Arcadia. Responding to a desire to honor those from Monrovia who gave their lives in the Vietnam conflict, the club under the leadership of President Rob Hammond provided the funding for a memorial in Library Park bearing the names of those who perished. The monument was dedicated May 27, 1996. The construction of a new public library in Monrovia inspired the Club under the leadership of President Mary Ann Lutz to establish a fund for the purpose of helping to furnish the new building once it was completed. Several years of fundraising activities allowed the Club to assist with the innovative furnishings of the “Cozy Corner” in the children’s wing of the new library. The area has been a favorite of young library patrons since the library opened in 2009. While not visible to the general public, “Fort Rotary” at the Trask Scout Camp in the mountains above Monrovia enhances the camp experience of those scouts who spend time there. A joint venture with the Rotary Club of Arcadia, the project was designed and constructed by Rotary volunteers. Additional civic projects include a drinking fountain in the alley of the 600 Block of S. Myrtle Avenue, and the scoreboard at the Mary Wilcox Youth Center. Monrovia Rotary has participated in several international service projects in addition to local projects: a water well in Africa, construction at Valle de Las Palmas in Mexico, a house for a deserving family in Tijuana, school supplies for children in South Africa, and wheelchairs for those who cannot afford them in Mexico. The project with the broadest scope has been participating in Rotary International’s goal, with the assistance of the Gates Foundation, of eradicating polio throughout the world. Members of the Monrovia Club have given generously to this ongoing project, and the goal is now within reach. All Rotarians would like to see polio join smallpox as a disease banished from the face of the earth. There has always been a strong relationship between Monrovia Rotary and the students in Monrovia’s public schools. In addition to providing academic achievement awards to deserving students at Monrovia’s two middle schools, the Club provides numerous scholarships to graduating seniors at Monrovia High School as well as Canyon Oaks and Mountain Park Alternative Schools. Monrovia Rotary also supports the Monrovia Adult School with financial assistance for specific areas of vocational training. Rotary’s motto has been “Service above Self” almost since 1905 when Rotary was founded in Chicago. The members of the Rotary Club of Monrovia are grateful for ninety years of service to our community and for the dedication of individual club members that has made our service projects possible. Just What is Rotary Anyway? “I am so excited, nervous and elated to be President of what I feel is the greatest service club of the foothills. I have learned a lot over the past four years that I have been a member of Rotary about the organization and it’s potential. My family, Gene and Elizabeth Roybal raised me to always think of others before myself and to do it with a SMILE or else! Jokingly, it truly became a way of life for me, my sister Gina, and my brother Martin. 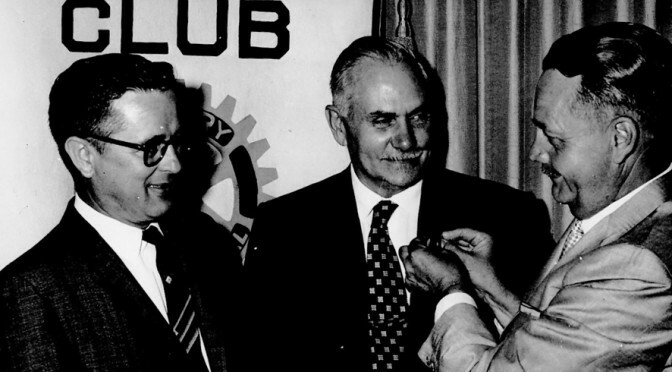 I was first introduced to Rotary by E. Eugene Orlowsky, D.C., a very active member of the San Marino Rotary Club. I worked with Dr. Orlowsky for almost twenty years and he inspired me to serve the community following Rotary’s motto “Service Above Self”. I later left working with Dr. Orlowsky to build my insurance business. I was brought to the Rotary Club of Monrovia by Councilman Tom Adams. He introduced me to the members and got me familiar with the goals and direction of our club. I am so proud and appreciative to have him as my sponsor. Rotary clubs are made of business owners and community leaders that share a common interest in the betterment of their community and the world. This is accomplished in cities all over the globe as Rotary is an International organization. The Rotary Club of Monrovia was chartered in 1922 and therefore we will celebrate our 90th birthday this year! Membership consists of attending a weekly meeting and contributing to service projects both abroad and in our local community. We currently have fifty-two members that meet weekly at Monrovian restaurant on Myrtle. We have a scheduled speaker each week that is typically a business person or organization representative that will speak to us about a topic of interest. It is informative and great to spend time with such a wonderful group of people that yearn to see change and work toward making it happen whether it is a small, medium or large size project. PolioPlus is Rotary’s flagship program. By the time polio is eradicated, Rotary club members will have contributed US$850 million and countless volunteer hours to immunize more than two billion children in 122 countries. The Bill Gates Foundation has also contributed significant amounts of money to Rotary to support the challenge of eradicating polio. Our club participates in local, domestic, and international projects. Internationally, we have helped organize and fund a water project in Malawi. 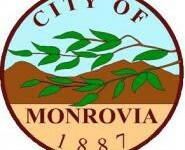 Domestically, we have provided care packages for the U.S. Military serving in Iraq, and locally, we have done many things for Monrovia such as contributing to the children’s library furniture at the Monrovia Library that was a conjoined effort with the Monrovia Kiwanis Club. We donated the Rotary Bandshell many years ago for music behind the library. We have donated Rotary Park and the water fountain at the library. Our club also sends four Monrovia twelve-year-olds yearly to a Teen Leadership Camp, and sends twelve of our Monrovia seniors to a similar Leadership Camp called the Rotary Youth Leadership Awards. We gave out scholarships the past year totaling $23,000. These things are accomplished through our members and our fundraiser that is done each year in September. 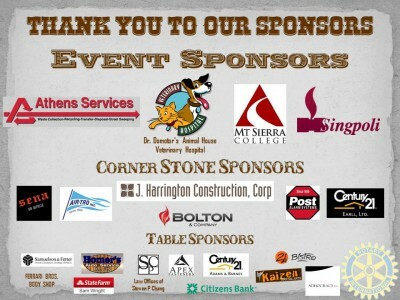 This year we will have an “Old West” BBQ & Casino night on September 22 at the Monrovia Community Center. We have a fun evening planned with great food, drinks and games. Even some possible country line dances! We are very much so looking forward to raise our goal so that we can continue to make amazing contributions to our community. We are a very social club as well. We have First Friday socials at local businesses to enjoy an appetizer / drink and to visit once a month. We are also planning to have Service Saturday’s every other month to assist local needs. Through Rotary I get to hear wonderful speakers, eat a good lunch, make new friends and network my business under the umbrella of changing things one day at a time. It is measurable and rewarding to know that you belong to an extraordinary group of people.